Eric Basiletti aka Kargall Le Fou is a conceptual French artist. 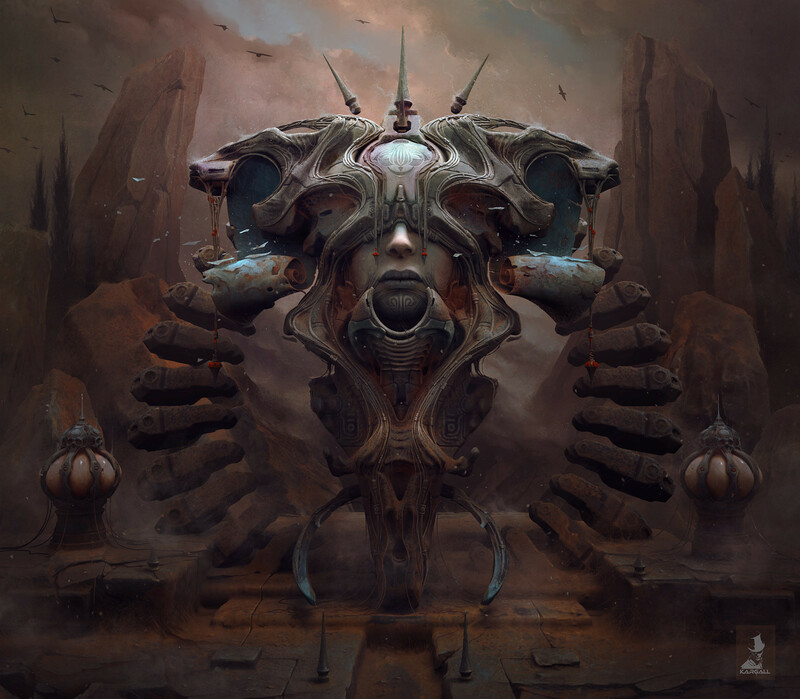 His portfolio is amazing; dark characters, aliens, or “mechas”. Digital artist of a great precision, inspired by music and painters like Caravaggio, Eric demonstrates a mastery of digital tools and software such as Blender or Cinema 4D. What is my artistic proposal? I like the characters “tragicomic” I’d like to have enough inspiration to make a picture as beautiful as repulsive. I almost succeeded a faith: a person exclaimed wow! It is super nice that ! then in this approach, he ended up saying: “Damn it, but this thing is foul” ? . I said to myself “touché!” , I would like to replicate this experience each time. Why images? I also wanted to make music but was asked to stop. Music makes me enter parallel worlds, I do not think I can “travel” without it. Tool, Bach, Vivaldi. Overall Dante’s universe and Christian eschatology mixed with dark-fantasy inspire me a lot. My favorite painters are Théodore Géricault, Caravaggio, Arnold Böcklin, Giger (obviously) my ultimate master being Zdzisław Beksiński. I am a traditional painter at the base I do a lot of decors in Trompe-l’œil or festival decorations. I work with oil almost exclusively for my paintings and acrylic for decorations. I started using 3D about 15 years ago for my “sketches” but the virus took me. I deepened my technique and I am now working in the entertainment field. I have two software of predilection: 3dCoat (the challenger of ZBrush) and Clip-studio-paint for overpainting. I am currently forming the incredible Clarisse (Isoropix) for FX and direct rendering via 3dCoat. I also like Cinema4D and Blender. Very difficult question. I imagine that my work may inspire some people, but to say what exactly I don’t know.